Is Gastric Sleeve Weight Loss Surgery Right For You? Have trouble with portion control? Now you have the option to have a portion of your stomach removed. (Yikes!) That should help, shouldn't it? 60-85% of your stomach is actually cut out in gastric sleeve (GS) weight loss surgery. It's a newer bariatric surgery, introduced in the US in 2007, and is still considered experimental weight loss surgery by most insurance companies. GS gets its name from the resulting shape your stomach takes on after surgery. After more than half of your stomach is removed, the resulting portion that's left behind looks like a long sleeve, tube or banana! The Gastric Sleeve (GS), also called VSG (Vertical Sleeve Gastrectomy), or simply Sleeve Gastrectomy, is considered a Restrictive procedure because it drastically reduces how much you can eat at once. You'll only be able to eat 1/4 to 1/2 cup at a time after surgery. Also, unlike gastric bypass, where the stomach meets the intestines is left untouched, so the stomach functions normally, empties normally, and there is no problem with dumping syndrome. Here's something major: The portion of the stomach that's removed is responsible for manufacturing the hormone that stimulates hunger, so the feeling of physical hunger should disappear after surgery. However, the surgery doesn't affect your brain, and so it won't have any effect on "head hunger," or "appetite." If you're an emotional eater, neither this surgery nor any other type of weight loss surgery is going to fix that! Read stories of others' weight loss surgery experiences. 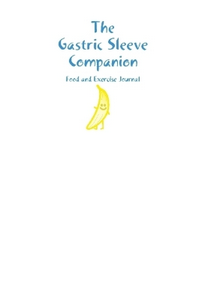 The stomach remaining after your sleeve gastrectomy will gradually stretch and permit larger meals. So you can stretch out your new smaller stomach and create more space that's always there to fill. That's right. Even removing more than half your stomach doesn't guarantee weight loss. You still have to eat a healthy diet and exercise regularly in conjunction with the surgery in order to lose weight and keep it off. ...it's not a magic bullet. Quite often, additional weight loss surgery is performed some time later after gastric sleeve. VSG can be "converted" to gastric bypass or a duodenal switch if the amount of weight loss is not sufficient and you and your doctor determine a malabsorptive surgery is desired. Gastric sleeve surgery may also be performed as the first stage of duodenal switch procedure if you're at high risk for complications. In this case, you know you're getting two surgeries up front, but they're done one at a time. To date (August, 2008) short term outcomes in 775 patients having sleeve gastrectomy have been published in peer reviewed literature. Average weight loss is quite variable: 33-83% of excess body weight. (That's the amount you weigh above and beyond what you should weigh.) This weight loss usually happens between 1-2 years post-operatively with most occurring within the first year. Since the surgery is so new, there isn't much published evidence for sustained weight loss beyond 3 years. That doesn't necessarily mean you won't keep weight off beyond 3 years. It simply means the surgery hasn't been around very long, and not enough people have had it to know what happens over a longer period of time! There's one published study comparing gastric sleeve to gastric banding that shows the gastric sleeve to be at least as effective as the lap band at 1 and 3 years following surgery. Overall Translation: Less than 1000 patients with VSG have been studied and we really don't know what happens beyond 3 years! You should know the evidence so you can make an informed decision for yourself. As with any surgery, there are risks. A portion of your stomach is cut out using a stapling device and then the surgeon sews over the staple line to try to prevent leaks. However, this is not fool proof. If your stomach leaks or there is a small perforation, it could cause a condition called peritonitis, which is life threatening. Keep doing your own research so that you come up with an informed decision about whether or not gastric sleeve weight loss surgery is for you! Never take the word of just one surgeon who just happens to perform only this one kind of surgery! There is no "official" VSG diet. However, being a restrictive type of weight loss surgery like gastric banding, sleeve patients follow a diet similar to lap-band diet. Get all the nitty gritty details about lap-band diet on my lap band surgery website. See you there! Watch a video of the gastric sleeve being done. Make sure you have a "strong stomach" if you decide to watch!